Ok, so my Twitter followers will know that yesterday I set up a petition to save John Lewis Haberdashery departments after news articles appeared on The Telegraph and The Pool. And here's why I did it! 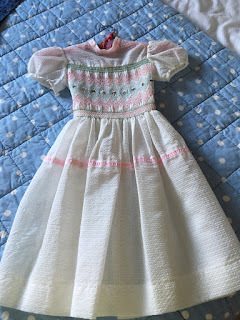 When I was four years old, my grandmother made me a party dress. It was white, with puffed sleeves and the prettiest pink floral smocking across the front. 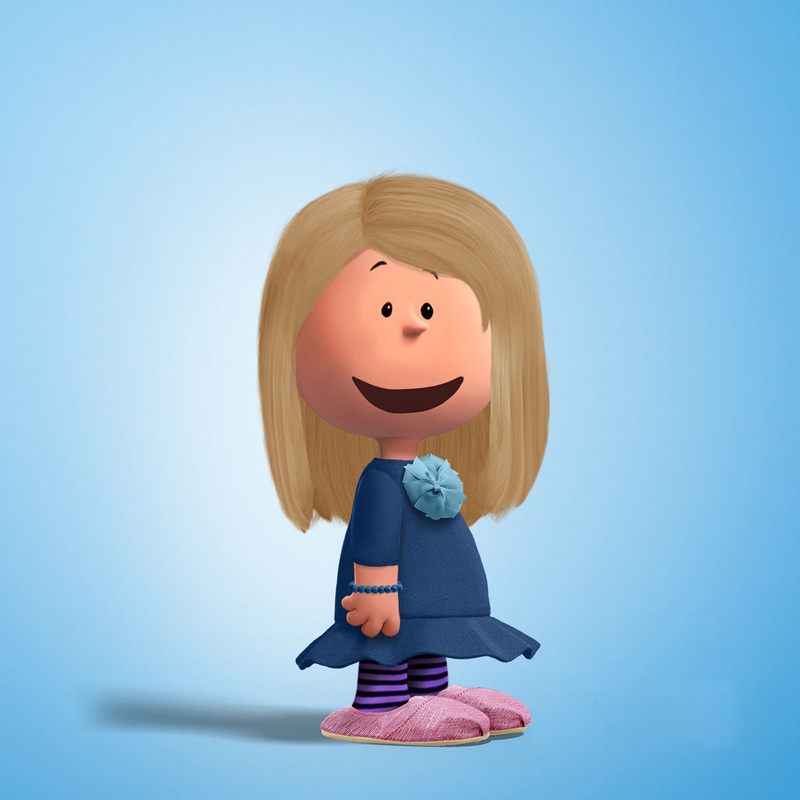 I wore that party dress to every party and attempted to wear it to a good many non-parties. I loved it. I still have it. Since my first memories were made, sewing, craft and creating things have been an integral part of my life. My ma, like my grandmother was, is an amazing seamstress. She made my school uniform when I first went as I was too small for the regulation one, and then continued to make my school uniform because hers was quite frankly better quality and better fitting. It was so close to the real thing, no one noticed, but it had clever hems to let down and all sorts of other things. I used to get home from school and she'd have a craft project ready - from cushions to cross stitch, soft toy making to t-shirt printing, we did it all, and it was amazing. And at school, where I struggled to hear traditional subjects where teachers stood at the front of the class and recited facts, I found that in textiles, I could still excel. 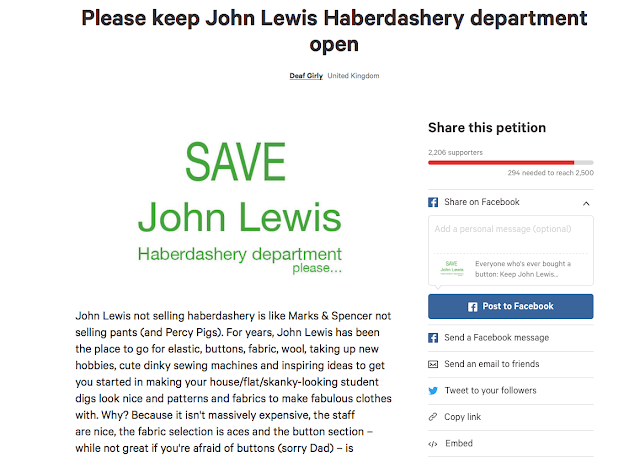 So that's why, when I read that John Lewis is downsizing, doing away with, getting rid of its Haberdashery departments in favour of prosecco bars and bikini waxes, I set up a petition to let the company know how much its Haberdashery department is loved and valued. And this is coming from someone who loves prosecco. And at time of writing, nearly 1,000 of you have let me know you feel the same way. John Lewis was the place I headed to one Christmas to buy red and green felt, glitter fabric paint and ribbon with which I created hand-made personalized little stockings for all my friends - many of whom still hang them on their trees every year. It was the place I bought elastic and cotton to help make hair scrunchies with my cousins when the 1990s started becoming fashionable again. I headed there to buy a denim patch when I went through the knees of my favourite jeans - and I really don't have the kind of knees that should be poking out of jeans. And when London Cousin 1 declared a proper interest in sewing - it was to John Lewis I sent her to buy her first machine. And she excelled from the moment she got going. As a deaf person, I have a lot of solitary hobbies. I find them easier, more enjoyable than group events or team sports where I struggle to hear. Craft, making things, creating and designing - however badly as I'm really not that good at it - is something that a great Haberdashery department like John Lewis allows me to do. In the above, Peter Cross confirmed that John Lewis haberdashery departments would not be downgraded or shut... he said some very nice things about haberdashery in fact. Good work peeps and thanks for all your support!
) . A business savy new CEO will have been trained to speak to the media, she would not say something that was not true. Sorry I think we will find slowly creeping downsizing , hoping we will not notice, like ribbons no longer being in anything but precut lengths, and embroidery silk not stocked, they will hope these will go under the radar.As it was I was in Cambridge last week and was amazed at how little material they now stock , even from six months ago. If you do met Peter please as him what Paula meant then!! You are doing a fab job , in digging around facebook my sister came across a reply to a question about their hab depts, , their PR person Jo wrote ," we will not be completely closing our haberdashery departments," that is a vast difference from what they have spun to the media on Tuesday , we need crafting supplies and a good choice of reasonably priced materials not overpriced kits for people who have no idea how to make stuff from scratch. I remember the Oxford Street store hab dept before they moved it upstairs, it was wonderful , about 1/4 of the ground floor given over to fabric, yarns, supplies and ribbons, hundreds of them, I see no reason why they cannot do this again, the market is worth millions.